Grey Ops: Who is the Paintball Manufacturer to Watch in 2011? 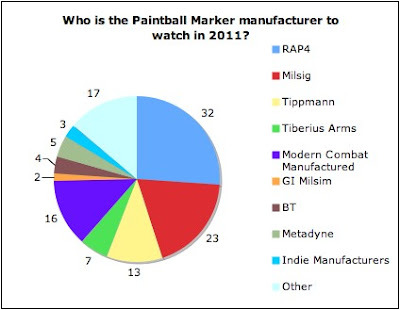 Who is the Paintball Manufacturer to Watch in 2011? Being a milsim paintball oriented publication, I only included those I felt pertinent to Grey Ops' audience (although I suppose 13 of the 122 voters are fans of the space dildos). RAP4 came out on top, with Milsig second, and the newcomer Modern Combat Manufactured took 3rd place. I have no choice but to leave the poll open (because of Facebook's lack of poll options), so it is possible that the results will change with time, but the post will soon disappear into one of the archived pages on Grey Ops' Facebook page. I could go on at length talking about what I think of the rankings, but I'd much rather hear what you guys have to say. Let's hear it!